Not to be confused with Women in Niger. Women's social role in Nigeria differs according to religious and geographic factors. In the north, Islamic practices were still common. This process meant, generally, less formal education; early teenage marriages, especially in rural areas; and confinement to the household, which was often polygynous, except for visits to family, ceremonies, and the workplace, if employment were available and permitted by a girl's family or husband. For the most part, Hausa women did not work in the fields, whereas Kanuri women did; both helped with harvesting and were responsible for all household food processing. 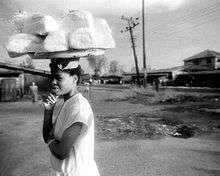 Urban women sold cooked foods, usually by sending young girls out onto the streets or operating small stands. Research indicated that this practice was one of the main reasons city women gave for opposing schooling for their daughters. Even in elite houses with educated wives, women's presence at social gatherings was either nonexistent or very restricted. In the modern sector, a few women were appearing at all levels in offices, banks, social services, nursing, radio, television, and the professions (teaching, engineering, environmental design, law, pharmacy, medicine, and even agriculture and veterinary medicine). This trend resulted from women's secondary schools, teachers' colleges, and in the 1980s women holding approximately one-fifth of university places—double the proportion of the 1970s. Research in the 1980s indicated that, for the Muslim north, education beyond primary school was restricted to the daughters of the business and professional elites, and in almost all cases, courses and professions were chosen by the family, not the woman themselves. In the south, women traditionally had economically important positions in interregional trade and the markets, worked on farms as major labor sources, and had influential positions in traditional systems of local organization. The south, like the north, had been polygynous; in 1990 it still was for many households, including those professing Christianity. Women in the south, especially among the Yoruba peoples, had received Western-style education since the nineteenth century, so they occupied positions in the professions and to some extent in politics. In addition, women headed households, something not seriously considered in Nigeria's development plans. Such households were more numerous in the south, but they were on the rise everywhere. Generally, in Nigeria, development planning refers to "adult males," "households," or "families". Women were included in such units but not as a separate category. Up until the 1980s, the term "farmer" was assumed to be exclusively male, even though in some areas of the south women did most of the farm work. In Nigerian terms, a woman was almost always defined as someone's daughter, wife, mother, or widow. Single women were suspect, although they constituted a large category, especially in the cities, because of the high divorce rate. Traditionally, and to some extent this remained true in popular culture, single adult women were seen as available sexual partners should they try for some independence and as easy victims for economic exploitation. In Kaduna State, for example, investigations into illegal land expropriations noted that women's farms were confiscated almost unthinkingly by local chiefs wishing to sell to urban-based speculators and would-be commercial farmers. 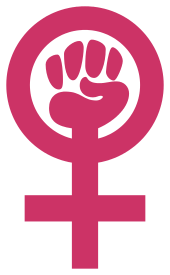 A national feminist movement was inaugurated in 1982, and a national conference held at Ahmadu Bello University. The papers presented there indicated a growing awareness by Nigeria's university-educated women that the place of women in society required a concerted effort and a place on the national agenda; the public perception, however, remained far behind. For example, a feminist meeting in Ibadan came out against polygamy and then was soundly criticized by market women, who said they supported the practice because it allowed them to pursue their trading activities and have the household looked after at the same time. Research in the north indicated that many women opposed the practice, and tried to keep bearing children to stave off a second wife's entry into the household. Although women's status would undoubtedly rise, for the foreseeable future Nigerian women lacked the opportunities of men. Wikimedia Commons has media related to Women of Nigeria.